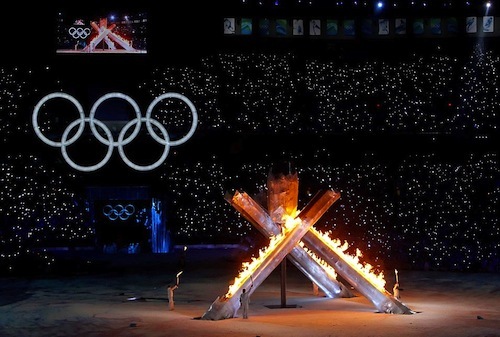 The Vancouver Olympics is especially exciting because it combines all of our favorite things: Twitter, Facebook, Google Street View, recycled computer guts, iPhone apps, and mind-controlled light shows. Oh, right, and sports, I guess. Google has unveiled a few new timewasters for the Olympics, way beyond the by-now expected Google logo redesign. They’ve sent the first Google Street View Snowmobile up into the mountains of Whistler to capture the slopes, so you can take a tour of the slopes while staying comfortably in bed. Besides Street View, they’ve also used Google SketchUp to create photorealistic, 3-D renderings of every single Olympic venue, from the Whistler Sliding Centre (home of the bobsled, luge, and the absolutely bonkers skeleton) to the bluntly named Canada Hockey Place. There’s a little bit of a battle going on between Facebook and Twitter for the gold in Olympic Social Networking (note: not a real sport. Yet. ), but there’s no rule that says you can’t follow both. Twitter and NBC have both put together lists of authentic athletes’ Twitter accounts, so you can learn that Olympic Biathlete Jeremy Teela plays Big Buck Hunter in his free time. Countering that is Facebook, which has received a little more official support. The International Olympics Committee set up a Facebook page, collecting updates from big name Olympic athletes like Shaun White as well as running fun little contests and giveaways. Even better, they’re constantly updating with both official and attendee-taken photos. Of course there are a host of excellent iPhone apps designed to help you keep up with the Olympics. The best have been collected by iPhone Hacks, but here’s a quick summary (all links hereforth open iTunes). CTVOlympics.ca is the official app, with a complete schedule, news, and medal announcements; 2010Guide is the preferred app if you’re lucky enough to actually be in Vancouver, tracking nearby events with GPS; and SportLogik has a glossary of events, so you can verify that yes, the biathalon is the greatest sport of all time. Vancouver’s gold, silver, and bronze medals are all constructed partly of metal collected from discarded circuit boards. Teck Resources, a Canadian mining company, supplied the Royal Canadian Mint with recycled gold, silver, and copper (there’s not much bronze in computer parts, apparently) from which these particularly beautiful medals are made. Each medal is laser-etched with a unique design, and the medals are all wavy, meant to simulate the topographic diversity of Vancouver. Bright Ideas is an even weirder, well, idea: Visitors in Vancouver can control light displays at three Ontario landmarks, across the country (Toronto’s CN Tower, Ottawa’s Parliament buildings, and Niagara Falls), with their minds. They wear a headset equipped with sensors that determine the pattern of alpha and beta waves, and communicate those findings to a computer which changes the lights appropriately. It is, of course, completely nuts, but also sounds like a lot of fun. Not everything at the Olympics is competitive: the Weblimp and Bright Ideas projects are tech-focused installations designed simply to entertain those in Vancouver. The Weblimp is a crowd-sourced, three-foot-long blimp, equipped with a wireless camera that takes in its surroundings. It moves according to the movement of the crowd around it–if the crowd shifts in one direction, the Weblimp will shift as well. It was created by students at Canada’s Simon Fraser University in BC, and will be on display in its own tent during the Games.